This is an Add-on & Dependent to SetyCz - Chickens Mod it expands on his mod to include support for modded Minecraft. It is a good idea to delete your old config files when you update (As long as you have not edited the configs your self). This Mod has had a few changes and old config settings could cause issues. Some known issues with this is sometimes certain parent types just wont work. So when you edit configs just know that sometimes the parent combination may not work. The chickens in JEI wont have a parent type and the Chickens will display as a tier 1 in waila. Adds in 59 new chickens all preset with parents for breeding. I will also be adding in new chickens based on just vanilla. If you have ideas post them here in the post. that's actually an easy enough set up, same as the Copper/Tin/Bronze/Brass/etc. except instead you use logWood as the search criteria instead of oreCopper/ingotCopper/nuggetCopper/blockCopper (not sure which is checked, copper used as an example). just pretend you are trying to become compatible with the same woods that the various BiblioCraft versions use, make sure you handle the varieties added by mods like Forestry where the different Saplings for example all are just 1-2 IDs with a ton of MetaData. Would require a bit of testing to debug, but should be very possible. 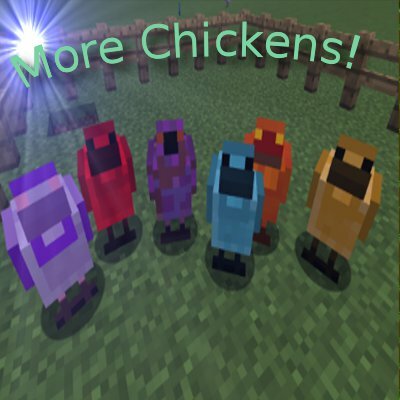 I was talking with my Curse group today and we had an idea for an awesome set of chickens: Since AE2 has made the jump to 1.10.2, perhaps you could add certus chickens to your mod. If you added those, then obviously we'd need charged certus chickens. The mechanism for this, however, would be a little different. You would need to add something to the hatching nests called a "Chicken Rod." The purpose of the chicken rod would be to catch lightning (similar to how Immersive Engineering does it) and then "charge" the certus chickens so that their next X number of drops are charged certus instead of regular certus. Its a neat idea, and I could add those chickens in, but adding that in to be dependent on hatchery isn't a good idea, They are two separate mods that work together. Id have to add a new mechanic. Im' adding in new mechanics for special chickens and it may be able to be added into that. Although I love the idea, I'd have to add in a different mechanic into more chickens. You're right -- Chickens, More Chickens, and Hatchery all work seamlessly together and I forgot they're all written by different people. You could add in a special charging nest of sorts and require either lightning as I'd originally suggested, or RF/Tesla/EU input up to a certain amount to charge the chicken and let it output charged certus. That could be doable and could be self-contained for your mod without relying on the others. Is it my imagination or did blood chickens used to give blood eggs? I was really hoping to use them for blood magic. I went through the change logs. Apparently I hallucinate blood chickens. I'd like to request life essence chickens, similar to the lava and water chickens, for use in blood magic. Will see about that I had thoughts of implementing new fluid chickens. Steam eggs? o_O Maybe liquid xp compatibility. I'm still thinking of how I can work this into my modpack. There are blood chickens but they are meant for Tinkers coagulated blood. what are meant to do with the orbs from the XP chickens? cant eat them, cant put them in fluid tanks... im out of ideas.. anyone else know? So I meant to make this so you could eat them.. looks like I never finished the xp orb. Its my bad because I had 5 different mods needing updates I must have accidentally crossed this of my list. As of know you can only drop them on the ground they turn into exp orbs, but don't do it as a stack as it will only drop one orb for the whole stack. Edit: I had to arcive it because of a jei recpie bug. Are they dropping the usual vanilla xp orbs? If so, use em for enchanting. If they're dropping xp orb items, idk. Try installing JEI and pressing R while hovering the cursor over them. Could we get a chicken that drops a Nether Star Shard (1/9 of a full one) at about the same rate as the Awakened Draconium? Also, Energetic Alloy and Vibrant Alloy/Nugget chickens would be awesome too. Bred from their respective alloy parents. Im looking into adding EnderIO as well, the Nether star will be added into the Base Chickens mod. He is working out the concept of how he wants to implement it.